Does this taxation increase to pay for wars abroad scenario sound familiar? Seems nothing regarding wars never changes. Anyway, he banded with likewise tax resisters, survivalists, and so-called gangsters, all men, and camped in the woods. He supported the legitimate King Richard over the English government ruling in his absence, making Robin Hood a Tory. If Robin Hood lived today, he would probably be considered extremely conservative, reading gun fanciers’ magazines (the modern equivalent of the longbow), loudly proclaiming his right to hunt, dressing in camo, driving a van, loving freedoms and just laws of the land and using the sort of political action through violence against the evil machinations of the powers that be- he would be known as a leader of a revolution, for the people, by the people and with the people. Basically appreciating and enforcing the Constitution of the U.S.
That’s not exactly socialism, but it is a sort of redistributionism associated with many clans the world over. That’s not exactly what he did. 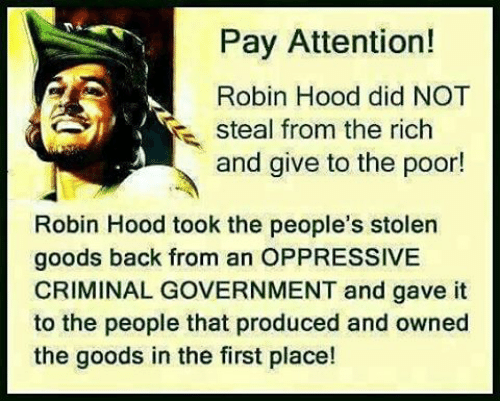 Robin Hood took back that which was taken from the countryside’s people. And, If the state isn’t on your side, you need to bribe the local state sympathizers to gain their favor so they won’t roll over on you and turn you into the supposed elected powers. Seems that some “people” know more about redistribution than those who mention the idea. The easiest way to aid aid the people is to (take back that which was stolen from the people) distribute food to starving peasants, torture unfair task masters in front of their employees, toss bags of money out, etc. The Australian bush rangers did that, as did pirates when they raided government/merchant ships, so did the Japanese yakuza at one time; we can put Robin Hood in the same category as well, an ultra-rightwing groups. Thumbs up for Robin Hood! True leaders must be willing to go against the grain for the sake of the less fortunate, helping those in need without a regard to repay. Not a political idealist full of lies and flattery; hypocrisy. We ARE on the side of the underdog. Credit in most part to Jonathan C.